The Military for Religious Freedom Foundation, a watchdog group that has waged repeated battle with the armed services, took issue with the last clause of the sentence, saying that no cadets should be forced to make a promise to God. After the complaint was filed by MRFF, the Air Force Academy Honor Review Committee met for an in-depth discussion regarding the oath. On Friday, the AFA released a statement saying they had decided to make the final clause of the honor oath optional. "The fact that the oath is optional will be communicated in honor lessons, leadership lessons, and religious respect lessons during the summer (cadet basic military training) so all trainees will understand prior to taking the Cadet Honor Oath that the final clause will be completely optional," said Vidal. "The person administering the oath, who is the cadet wing honor chair has the option to say or not say 'so help me god," so this might vary from year to year," Vidal continued. Mikey Weinstein, MRFF's founder and president, said he would sue the academy on behalf of his clients if the words were still left at the end of the oath, even if repeating them was optional. MRFF has taken issue with the Air Force before. 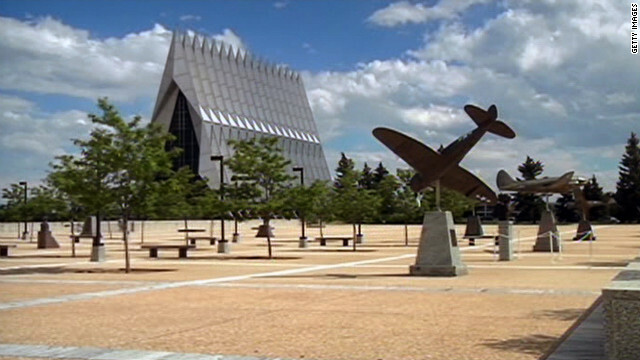 In 2011, the group complained about an Air Force training presentation that used religion to teach the ethics and morality of using nuclear weapons. That same year, CNN learned that the Air Force was using religious tenets such as the Ten Commandments to teach core values to ROTC cadets. I have already been fact finding for the little bit for just about any top quality content in this particular types of place. Discovering in Digg I now located this great site. Scanning this info So i will very happy to communicate that We have a great uncanny emotion I came across what exactly I needed. My partner and i most definitely can make absolute to seldom forget this great site and provides it a glance frequently. But despite all that– a trained army cryptologist with 20 years of experience in cracking Soviet codes would not be able to figure out exactly what you were trying to say in that pile of gibberish! c'mon, I was simply stating an attribute that lord has given us. yes, he is a Judge as well. the world was rittled with sin, much like what it is now. Only next time when he will unleashes his wrath on the wicked...it will be with fire. He is offering a way of salvation that is given for free! Grace! how would you not want to accept that? And Jesus really existed. His Tomb is Empty. Everything in scripture has never been disproven, and only comes more and more to truth as time passes on. what more do you need? this perfectly engineered planet and it's inhabitants plainly illustrate that there is a creator...leaving no excuse to anyone to comprihend that theres more to our existence. I like Elijah . Yes Jesus is real . He came to me seven years ago to heal me. He has been a wonder father to me for thirty eight years . Don t reject him except him .He loves you. Elijah, Keep speaking what you know ! Thank you for making this sooo simple !! God be with you !! Since your god supposedly created this world, the creatures populating it, the ways the world works, and EVERYTHING else that is our cosmos– how can WE, as human beings, be responsible for the advent of "sin"? Blame your god for creating such a flawed world– and then holding that offense against us, as if we had a choice. People of the Republic of the United States hear my words. This issue is not about God or Jesus Christ. The issue is the law and how the Consitution provides for the masses and not just a few. The majority of people in the Republic believe in God and Jesus Christ as I do, but this should not cause a division in our society. This Republic was founded by our forefathers on and by the word of God, so let it be so. No, our natiion most certainly was not. Take a history lesson and read about the treaty of Tripoly. It is a common misconception by christians that think our forefathers thought like you do. Their beliefs and your beliefs do not match up. Too bad the principles that are enumerated in the Christian bibles are not followed in the actions of those who profess so loudly to follow them. Does that include the treatment of slaves, beheadings, and all the rest? And get the reference to GOD off of the US currency. In case any new visitors are not aware: there is an insane/inane person who frequents these blogs who poses as the regular, established screen names of certain posters with whom he disagrees or whom he doesn't like. just want to reply to "Booty Funk", How did you come up with that name?? For real !! @Donovan "I thank God that He has revealed His truth to me"
However you refer only to Christians like you and Atheists. What about all the other of God fearing folks out there? You fall into the one of the Big Myths of right-wing Christians: that there are born-again-Christians and Atheists. What about me? I believe in God and am not an Atheist and am not a born-again like you apparently. Where do I fit in your fantasy world of the Christian Country of the USA? The founders of this great land were a mixed bag of many faiths, some very different from what you believe! Have faith but keep State Endorsed Religion out of MY Government! No one compares to him. And for the billions and billions of people that believe otherwise? Everyone who believes that Jesus and God are one in the same most often refer to the Gospel of John because you won't find that assertion in the three other gospels of Mark, Matthew, and Luke. However, Jesus himself makes it clear that he (the Son) and the Father are not one and the same. Speaking to his disciples about the "end times" in Mark 13: 32, Jesus says: “But about that day or hour no one knows, not even the angels in heaven, nor the Son, but only the Father." silence DoGood, MY gov't too and I agree with Donovan. Anyway...if these atheists really don't believe in God, why do they work so hard to keep Him out of things? Its like little kids with the bogey man, grown ups chuckle and tell the kids "don't worry about it" and know they will grow out of it. These "atheists" fight tooth and nail for something they don't believe is real in the first place. Why don't they just shut up already like grown ups. Probably because they are scared to be alone when God does come to judge. Your last sentence is incredibly laden with irony that you will probably never understand. Serviceguy, amen. as the saying goes "me thinks they do protest too much." They know they will have to face Him one day, and they try to put that out of their minds, but somehow aren't able to do that. Or maybe the inherent absurdity of adults believing they are in telepathic communications with invisible people in the sky– is worth discussing to us? Apparently, Christians are so shaky in their beliefs that missing a prayer in a government meeting will cause them problems. If believers practiced what they preach, we'd have a huge reduction in HYPOCRISY. You really should rethink your posts. You appear unbalanced. So cake, what do atheists preach? Yep. Tough luck for the millions and millions of people who never heard of Jesus. Doesn't matter if they were good people or not. Observer, you are thinking in your fleshy mind not according the Spirit of God. We all have a problem, it is called sin. There is only one way to deal with that problem, that is Jesus Christ. God solved this problem for us by sending Jesus to atone for our sins so that we could have eternal life. If we reject His only provision, then we will die in our sins, there are no exceptions. Yep. No answer other than "tough luck" for the MILLIONS and MILLIONS of people. And here's another christian who celebrates the idea that an innocent man was tortured to death so that he doesn't have to be responsible for his own actions. Christians are a bloodthirsty lot. Quoting Biblical verses until you are blue in the face does nothing to convince non-believers. The same book you hold as an intellectual authority on EVERYTHING, also says we should make our wives live outside the city walls when she is menstruating each month. I'm glad you found a crutch to lean on, Donovan, but not everyone needs one. You'd be surprised by how many people are capable of being decent, responsible human beings without empty supernatural threats and promises. A crutch? we like to refer to him as our ROCK! when you are broken through what life throws at you, who will you turn to? And you may think you're decent because of you're own will? God is love, and abides in all of us. we are made in his image. there is no scientific or logical reason for the emotion of love. where does that come from? so, NO, my friend, you are not the person you are simply by chance. your heart and conscience bears witness to our creator's divine nature. whether you want to accept it or not, the choice is entirely yours. God left us with a manual to this life...called the Bible. we are cut-off from him by sin, but we have been redeemed by a perfect sacrifice..Jesus Christ. oh, and there IS a spiritual realm. it's all around you. You, along with many others, need an awakening to whats really happening around you. Many , many other animals show love and many other emotions, so all animals are made in gods image? God loved th world so much he drowned and killed almost all life on the planet? Your religion is based on many myths that preceded it, yours is no different than ALL of the other religions...man made stories, man made myths, man made gods. Try joining us in reality. "Let's not make "Small Talk" of this matter and Prove to us other wise!! Till then.... Be gone" LOL. Since the believers are making a supernatural claim that seems to contradict every known natural law that we know about the universe– the burden of proof is on the believers. if I come in from outside and say: "There are cats and dogs falling out of the sky"– the burden of proof is on me– not on the other observers to prove me wrong! Another angle to this that the article didn't mention is that "god" is a generic term. It doesn't specifically mean the Abrahamic deity. Therefore, the assumption that "so help me god" is a direct reference to the god of Abraham shouldn't just enrage atheists, but also people who believe in a different god, such as people of the Hindu or Native American religions. US is the country of religious freedom. Do some research. My argument wouldn't be that I am offended so much... but that the oath becomes meaningless when it must be attached to bearded father figure sky god that will punish me for breaking the oath. I don't believe in that god, no offence, so any oath ending in 'so help me god' becomes hollow and meaningless. I may as well not take the oath, because, since I don't believe in that god or any divine retribution for breaking an oath... I would be free to violate it from a religious perspective (but not an ethical one). In short, you don't want me to swear to your god, I am free to lie to this god or dismiss it. So why bother with the oath at all? I really wish we could edit here... 'father figure sky god' was probably overly confrontational. But let me put it this way, would you trust me if I said 'I swear, to the all knowing and ever loving tooth fairy that I am telling you the truth!' ? I am guessing probably not. I am not saying the judeo christian god is the toothfairy, but I am saying, that, personally, I have the same belief in both. And you wouldn't trust someone swearing on something they simply don't believe in. Fear not, "bearded father figure sky god" is gentle wording here. Sadly, it doesn't seem to matter how courteous you are. Because you do not accept an Abrahamic or even an anthropomorphic God, people will object to anything you say, regardless of the words you use. I am not trying to be confrontation, just pointing out a logical reason why they honestly don't want someone swearing to a god they don't believe in. It's utterly pointless. Yes, it really would be nice to edit posts. Never say "no offense" when proclaiming your don't believe in god. The religious have gotten a pass for far to long on their myth being passed off as fact by the rest of us who don't believe in imaginary creatures. They are not saying "no offense" to us when they spout their bull about some make believe deity, so don't be afraid to say you don't believe. If they are offended, F them. Thanks for a news story from 3 1/2 years ago.